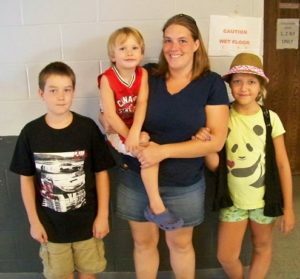 Shannon has been coming to food distributions for years, first starting as a volunteer to give back to the community. She continues to volunteer each week, but like so many others, is struggling to make ends meet and now gets help from the Food Bank. After getting married, having children and enduring some challenging life circumstances, Shannon is now coming to extend her budget. She home schools her children and also baby-sits kids to make a little extra money. Her husband also works full-time, but at the end of the month, “it doesn’t always work out,” she said. With life’s uncertain curveballs, Shannon isn’t sure how long she will need help from the Food Bank. But she does know that even as she struggles, she will continue to volunteer and help others in need.